I hadn’t asked for Hotmail. 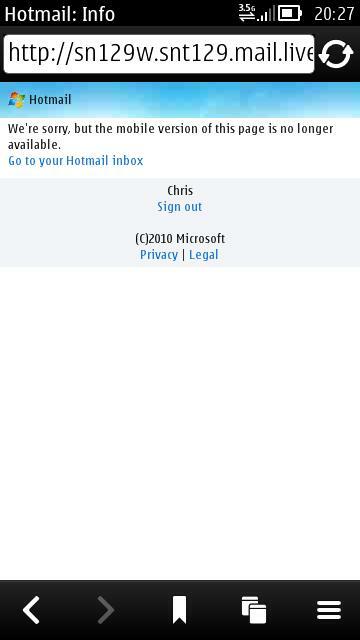 This is just where the site redirected me when I tried to log in to SkyDrive on my phone. I must say this is nicely fitting, in light of Microsoft’s recent attack on the unpredictability of Google Docs: “Different… better… completely gone…” Perhaps they decided it was time to get ahead in the race to “completely gone”. It’s a pity, as I kind of liked SkyDrive. I evaluated Office365 for business purposes a year ago, but gave up on it when I found it included no way to download your files—perhaps that was intentional for purposes of corporate control, or perhaps it’s fixed now, but it doesn’t seem to have been an issue with the SkyDrive office apps. In many ways I prefer the interface to that of Google Docs, and I think of Microsoft as the underdog nowadays in a way that makes me (dangerously) more inclined to trust them. And in fact, I probably will continue to use SkyDrive for the odd thing. But it’s clear now that Microsoft aren’t really all that great at keeping it running. I’m afraid, despite my liking for the service, that it does appear to be just a little bit pants.